Combustion Research Facility (CRF) researchers Kai Moshammer, Ahren Jasper, Arnas Lucassen, Arkke Eskola, Craig Taatjes, and Nils Hansen (all in Sandia’s Combustion Chemistry Dept.) as part of an international collaboration reported, in Journal of Physical Chemistry A, detecting and identifying previously undiscovered partially oxidized intermediates. This work provides experimental confirmation of the generally accepted dimethyl ether (DME) oxidation scheme at low temperature (~540 K, 267 ˚C). DME is a lower-soot-and-emissions alternative to Diesel fuel. Especially significant was detecting and identifying hydroperoxymethylformate (HPMF, chemical formula: HOOCH2OCHO)—a previously undiscovered partially oxidized intermediate—thereby providing critical information needed to improve combustion models. Pascal Diévart and Yiguang Ju of Princeton University. Schematic representation of the experimental set-up. Shown in the figure is the jet-stirred reactor that is located within an oven, all surrounded by a water-cooled stainless steel chamber. 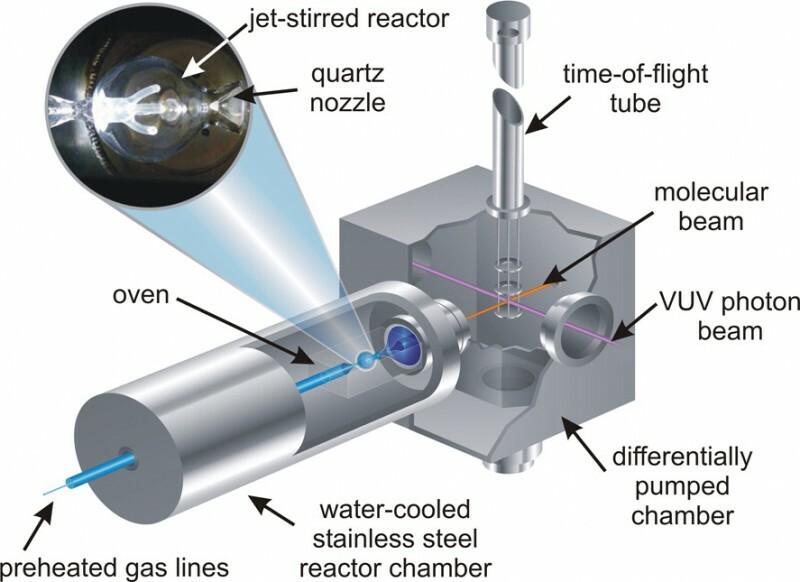 Molecules are sampled from the reactor through a quartz probe, ionized via single-photon ionization with vacuum-ultraviolet photons, and the respective ions are mass-selected using a reflectron time-of-flight mass spectrometer. Understanding the low-temperature combustion (LTC) chemistry of transportation fuels is increasingly important because the performance advantages of innovative engines, such as homogeneous charge compression ignition (HCCI) engines, rely on controlling low-temperature ignition timing. DME, a proposed alternative or additive to conventional Diesel fuel, has a very simple molecular structure (CH3OCH3) with rich low-temperature chemistry. However, recent experiments clearly showed that the description of DME’s low-temperature chemistry contained some uncertainty in the decomposition pathways and the branching ratio of the elusive keto-hydroperoxide species. a reflectron time-of-flight mass spectrometer that employs single-photon ionization via tunable synchrotron-generated vacuum-ultraviolet radiation. Combined, this apparatus allowed the research team to simultaneously detect many intermediates, including radicals and other very reactive species, such as peroxides. Coupling the mass spectrometer to a tunable vacuum-ultraviolet photon source, such as the chemical dynamics beamline at Lawrence Berkeley National Laboratory’s Advanced Light Source, enabled recording of so-called photoionization efficiency (PIE) curves that permit species identification based on their mass-to-charge ratio (m/z) and their ionization thresholds. The team’s experiments also detected HC(O)O(O)CH (formic acid anhydride), HC(O)OOH (performic acid), and HOC(O)OH (carbonic acid). Though all are conceivable HPMF decomposition products, they are not included in many DME oxidation mechanisms. The appearance of the carbonic acid might be explained by a decomposition mechanism that was postulated by Korcek and coworkers (see Figure below, right) and predicted theoretically. 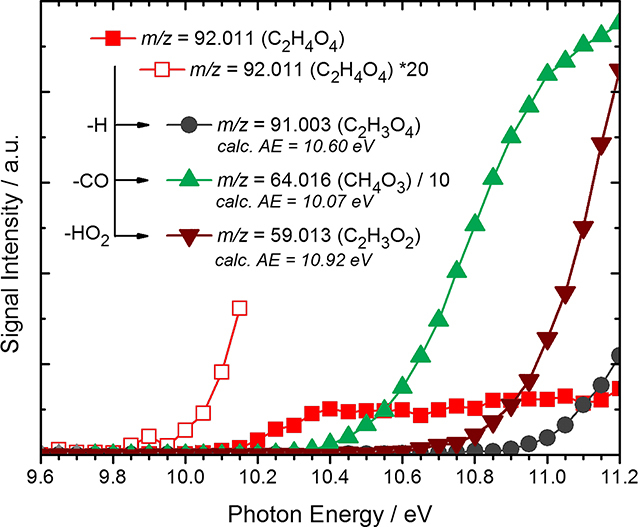 The team’s finding of the PIE curve for m/z = 62.000 u, which allowed them to identify carbonic acid as an intermediate, is the first experimental evidence for this proposed reaction. However, more definitive conclusions would require detailed modeling studies. Jet-stirred tank reactor (JSR)-sampled photoionization efficiency (PIE) curve for m/z = 92.011 u. The ionization threshold is observed at a photon energy of 9.85 (±0.05) eV. Signals at m/z = 91.003 u (−H), 64.016 u (−CO), and 59.013 u (−HO2) can be assigned as fragments. Graphical description of the Korcek decomposition mechanism of the HPMF molecule. The identification of carbonic acid [HOC(O)OH] as an intermediate might be explained by this pathway, thus providing detailed information needed for chemistry model development. Future work will focus on providing mole fraction profiles of the identified species as function of initial flow conditions, residence time, and temperature. Such data will, in turn, become the ultimate validation target for developing chemical models for low-temperature oxidation and will thus help to identify important oxidation pathways. Read the full story at the CRF website.